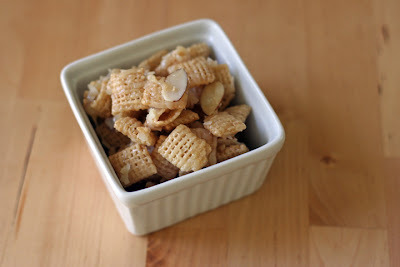 My favorite sweet treat is the Sweet Chex Mix recipe. Yum. Way back when I made these amazing chocolate cookies (thanks to my blogger friend Lindsey who created this perfect recipe). If you haven’t made these cookies yet, you really should. This recipe is a keeper. The best chocolate cookie recipe I’ve used. Awesome, delicious, perfect. Enough gushing? Okay. Now for today’s POP QUIZ. A simple True or False question for you. When you make cookies, you should cook all the dough at once. If you got the answer right, A+. If you didn’t, you fail…but it won’t go on your permanent record. Promise. I think food can be really beautiful. As an artist and designer, I definitely enjoy looking at food more than preparing it (of course, I don’t mind eating it!). This week, an onion won the “pretty prize.” I know this sounds cheesy, but I really enjoyed chopping this onion – the colors were especially striking to me. I loved looking at this onion. I didn’t even mind that it made me cry. And, no, I wasn’t crying because it was so beautiful…I’m not THAT bad. Seriously, though, I couldn’t wait to take a picture and share it with all of you. Thank you all for your menus every week. Participation is growing and I love getting ideas from you. Please keep the menus, recipes and comments coming!! 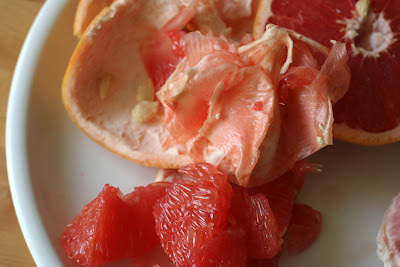 I went through a phase with two good friends where we ate red grapefruit ALL THE TIME. That was a super healthy phase in my life: everyday we ate grapefruit, spinach and cottage cheese for lunch and worked out together after work. Those were the days…what happened?!?! I’ll tell you what happened…TJ’s chocolate covered pretzels, that’s what. 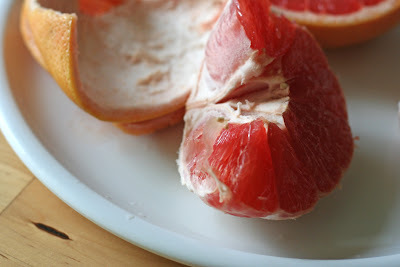 While I may not eat grapefruit every day anymore, I still LOVE LOVE LOVE red, sweet grapefruits (and Ruby Red juice, which I can chug, chug, chug). 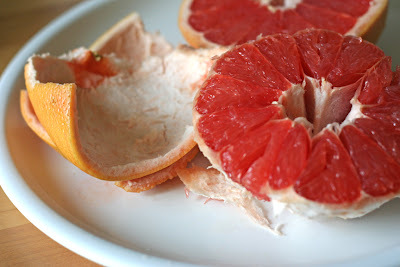 As I was enjoying an especially tasty grapefruit today (even Cate ate a few pieces! ), I decided I needed to share some pictures of it with you (yes, I went picture crazy today) as well as the most killer technique for eating it. 1. 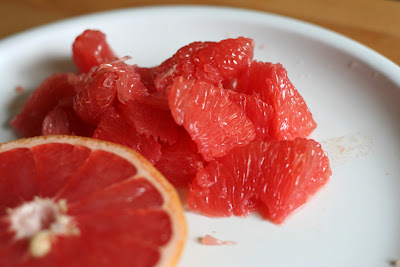 Get yourself a red flesh grapefruit – sample varieties are Ruby, Rio, or Star. 3. Break it in half (the only reason it’s cut in my pictures was because it was pretty…you don’t have to cut it) and peel off the rind from the grapefruit flesh. The rind pretty much stays together while you peel off the flesh from each slice. Forget a spoon. It’s only going to massacre your fruit, destroying the texture. Trust me – it is so much better this way and worth the extra 5 minutes it takes to peel. Yum. I do feel bad for my San Diego friends out there – REALLY! But not that bad, I suppose. It’s what we Patriots gotta do to reach PERFECTION. Seriously, a 19-0 season?!?! (And you all know it’s gonna happen.) Can New England sports get any better? Besides breaking the curse, of course. For all the non-sports readers out there, I’m done. Well, until the Superbowl in 2 weeks! Our good friends (remember Nikki, Christmas cookie extraordinaire?) recently got back from a trip to Nikki’s home state…Hawaii. Can you imagine growing up there?! 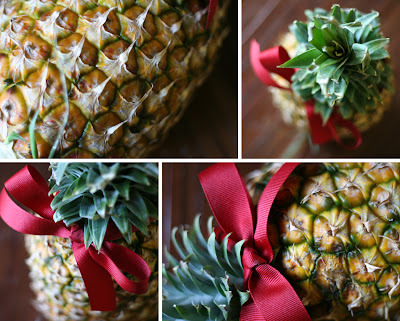 Anyway, they brought us a beautiful, deliciously ripe pineapple. I don’t know how they got this dangerous-looking fruit through security…but I’m glad they did. It was so good and sure did make for a pretty picture (in fact, I think she brings me beautiful foods just so she gets mentioned on the blog…keep bringing it, Nikki!). Here’s my menu. 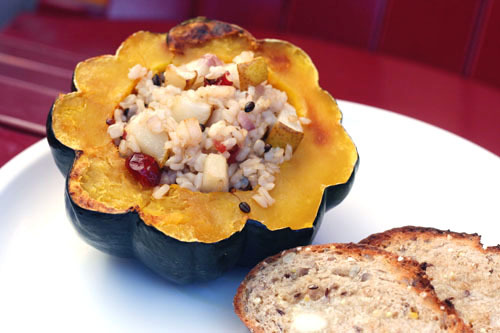 I can’t wait to see what you’re all eating this week! – Pasta of some kind…I just cleaned out the pantry a bit and discovered MANY bags of open pasta. Any suggestions for something easy and yummy that isn’t boring spaghetti & red sauce? 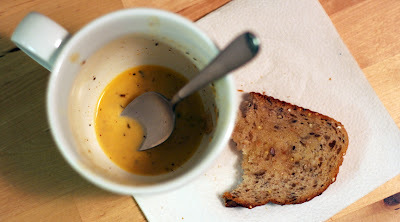 I’ve been meaning to write about this forEVER…but I would always forget to take pictures of the food! Finally got my act together. Today I want to discuss frozen orange chicken options. If you’ve been reading the blog for a while, you know I always sung the praises of Trader Joe’s Mandarin Orange Chicken (in the freezer section). It’s yummy, we loved it, ate it all the time. Then one day we tried Costco’s version (also in the freezer section and comparable in price). I never thought Costco would trump TJ’s, but in this case it did. Reason #1: The Meat. 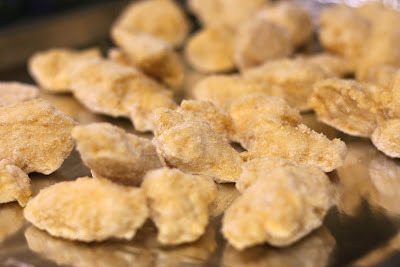 I mean, just look at those yummy frozen chicken pieces! It’s all white meat. TJ’s isn’t. Seriously, the first time I poured the Costco version on the baking sheet, I was shocked at how much more appetizing and yummy that chicken looked. Reason #2: The Sauce. I don’t necessarily agree with this reason…but Nate does. The sauce is different. I actually kind of like TJ’s sauce better because it has a little kick to it, but Nate definitely likes the Costco sauce better. It’s more orange-y and fresher tasting. Despite my affinity for the TJ’s sauce…I agree the Costco sauce is dang good. And the quality of the chicken in the Costco version definitely makes me willing to give up the TJs sauce. So there you go. Orange Chicken review finally done. I feel like I’ve cheated on Joe, but hopefully he’ll forgive me. I have a few friends right now who are starting their babies on solid foods. I was talking to Nate about it and he suggested I do a quick post! Sorry to the non-baby people out there…although, the book I mention below is a great baby gift idea! 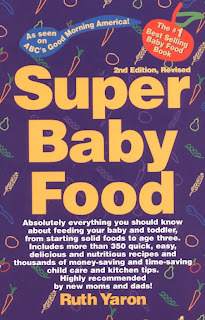 Tip #2: Super Baby Food by Ruth Yaron is a GREAT resource. If you want to make your own baby food, it’s a must-have. If you don’t want to make your own baby food, it is still a very handy book to have around. I used it a lot in the beginning. It really helped me to know what foods I could feed to Cate at what stages, etc. Despite eventually giving up on making my own baby food, I’m still very glad I had the book at my fingertips. You gotta get it, mommies! Now, bring on the menus!